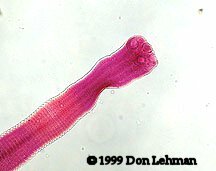 Hymenolepsis nana, the dwarf tapeworm, is probably the most common human tapeworm in the world. Humans acquire the infection by ingestion of ova. The ova, found in the stool of infected persons, have polar filaments (arrow) and are about 35 µm in diameter. The scolex of H. nana has four suckers and a short rostellum with hooks. H. nana is the only human tapeworm that does not require an intermediate host. 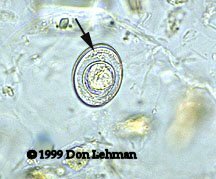 Eggs passed in the stool are readily infective for humans, and autoinfections can occur.